Tips and recipes for the MAX LIVING NUTRITION PLAN. GOOD FOOD recipes will help you ALIGN YOUR HEALTH Even If You Think You Can't Cook. All recipes are sugar free, grain free, healthy, and delicious. 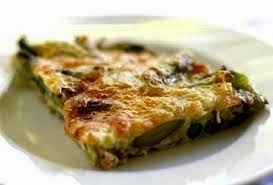 Asparagus Frittata has been a family favourite for Christmas brunch for years. Everyone enjoys the beautiful look of it, not to mention the delectable savory taste. But I have always enjoyed using it as the centrepiece of the brunch because it finishes in the oven while I put the finishing touches on the table and other specialties of the festive family meal. 1) Gently heat olive oil into a 10‐inch oven‐proof frying pan (see our blog on cookware) over medium high heat. 2) Add onions and salt and cook, stirring occasionally, until onions are softened, about 3 minutes. 3) Add asparagus, reduce heat to medium‐low, and cook, covered, until the asparagus are slightly tender, 6 to 8 minutes. 4) Pour in eggs and cook until almost set, but still runny on top, about 2 minutes. 6) Remove from oven with oven mitts and slide frittata onto a serving plate. Cut into wedges. This looks de-lish! I love Asparagus. Any suggestions for making it Lactose free and Gluten free? This is already Gluten free. To make it lactose free, simply omit the cheese(s). I would adjust the seasoning, particularly the salt, in that case. Taste and adjust!! Simple theme. Theme images by kamisoka. Powered by Blogger.